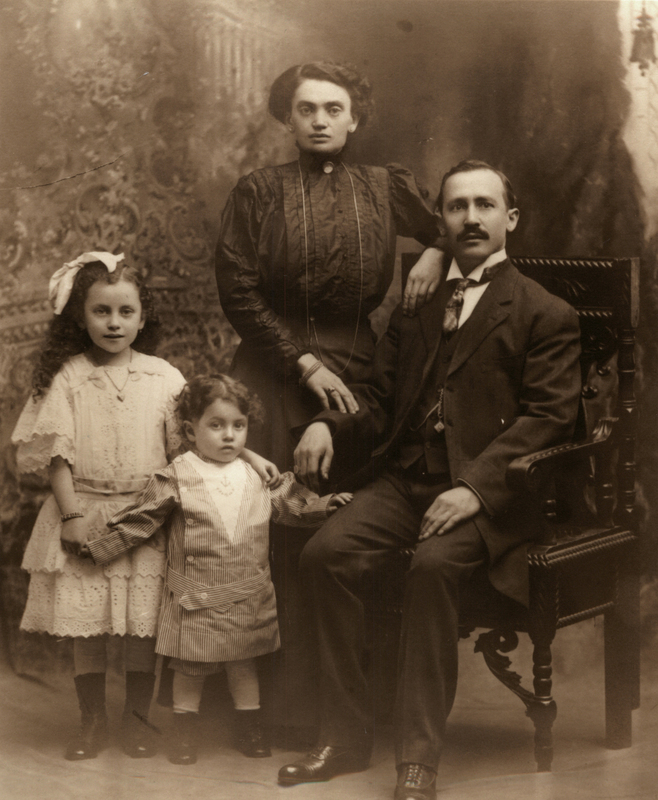 A great family portrait of my grandmother Esther, her brother Sidney and their parents, Max and Anna Kronenberg circa 1910. My father’s mother was Esther Kronenberg. That’s her with the big bow in her hair. She was born in 1904 and her little brother Samuel (Sidney) was born in 1908 so I suspect this photograph was taken around 1910. Her parents, my great-grandparents, were Mendel and Anna (born Genendel Szerman) Kronenberg. Max and Anna were both born in Poland but because Poland was partitioned for 123 years and didn’t geographically exist again until 1918, their documents all claimed to be from Russia. Mendel Kronenberg came to the US in 1900, one year ahead of his young wife, who arrived in New York in 1901. This was typical of 20th century immigrants. The husband would come first, find a place to live, then send for the wife when he was established. Learn more about Mendel, or Max as he was called in the US. Max had a brother Meyer Kronenberg who was married to Ethel Stanasowsky. They had one daughter Amelia who never married and died at the young age of 43 in 1943. Ethel died in 1940 and Meyer died in 1943. I’m not sure if Meyer and his daughter Amelia’s deaths were related. I had inherited a lot of photographs of my grandmother’s family and sadly, she hadn’t marked the backs of most of them to identify who they were and when the photographs were taken. There were several photographs of “unknown Kronenbergs” and my father, before he passed away, didn’t know who they were. There were photos of a young woman named Mollie (I somehow recall my grandmother saying she had a cousin Mollie) and a nice photo of a young man with the name Louis Kronenberg scrawled across the back in her writing. When I got a copy of Meyer’s death certificate, the death was reported by Mollie Kronenberg and it said the relationship to the deceased was that she was his niece. So after more research, I found both Max and Meyer’s older brother, Hersh Ber Kronenberg, who, in America, went by Harris B. I also found a second immigration document when Mendel was held for a few days for unknown reasons that listed he was coming to America to meet his brother, Hersh Ber, aka Harris B.
Max Kronenberg in front of his shoemaker shop in NYC circa 1904. Harris B. Kronenberg was born in 1855, a good 13 years older than Meyer and 19 years older than my great-grandfather Max. He came to America in 1890, the same year as Meyer and 10 years before Max. With his wife Chane (pronounced Hannah) Lustig, he had 7 children; William, Herman, Morris, Samuel, Ester, Louis and Mollie. While Max and Meyer stayed in the NYC area, Harris B.’s family settled in Sullivan County where they had a laundry business that catered to the resorts in the Catskills. In 1904 his wife Chane died and he remarried to Jennie Goldman in 1906. Harris B. died in 1933. Max and his brother Meyer were shoe makers and had this shoe store on the lower east side of Manhattan. That’s my great-grandfather Max holding my infant grandmother Esther in this photo. I’m not really sure who the young boy is but based on the age of the boy and the year the photo was probably taken, it could possibly be Louis Kronenberg. (Reminder to my readers to identify the people in your photos!) 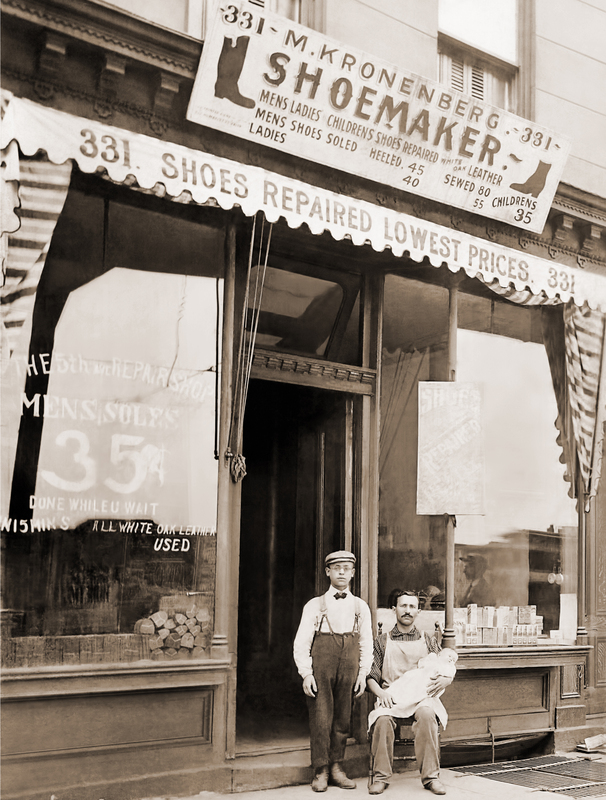 Also notice that to have men’s shoes soled and heeled cost only .45¢! A few years ago I found “Kodeń, A Shtetl No More,” a Yizkor book on the Jews from the town of Kodeń, Poland. In this book I found a long line of Kronenbergs, many married to Szermans going back to early 1700s. There was a Mendel Kronenberg with a brother Hersh Ber so I thought I had found the right family and believed that for quite awhile. Then after I found Harris B.’s records, I re-examined all my records and realized I had made a couple of errors. First, the birthdates of Harris B. and Mendel in the Kodeń list, while close, were not exactly the same. This is not that unusual in genealogy research. Many records often have different dates and different name spellings. But a more important mistake was that on my documents, the father for Harris B., Meyer and Max was listed as Solomon Zalman Kronenberg (his wife was Hannah Szerman) and that all 3 men claimed to have come from Brest Litovsk which is in present day Belarus. In the Kodeń family, there was no Meyer (which could have been a missing record or omission), but Mendel and Hersh Ber’s father was listed as Fiszel Leyzor Kronenberg. Fiszel’s wife was Chana Szerman (have I mentioned there was a long history of Kronenbergs marrying Szermans) but still, Fiszel Leyzor didn’t sound anything like Solomon Zalman. So that had me thinking we had two distinct Kronenberg families now. But since Kodeń is only 18 miles to the south, making it literally a subdivision of Brest, it’s possible that when emigrating, the Kronenberg brothers said they were from the closest big city. I am still researching the Kronenbergs coming from Brest and at this point, I suspect that they are closely related to the Kodeń Kronenbergs since they have the same given names and the custom of marrying into the Szerman family. Also Meyer’s wife, Ethel Stanasowsky, was from Kodeń. There is also another branch of Kronenbergs from Warsaw related to Leopold Kronenberg, who took part in the foundation of the Warsaw Credit Union in 1869 and the following year established the first joint stock bank in Poland, Bank Handlowy at Warsaw. Bank Handlowy became what is now Citibank.